« Extension says thank you! So, what’s getting planted at Bee Heaven? Radishes, pole beans and lots and lots of heirloom tomatoes. Stopped by last Friday and saw that most of the prep work had been completed. Irrigation drip lines have been run, connected and leaks mended. Rebar stakes were driven into the ground, and rolls of wire mesh trellising stretched across as a support for the tomatoes. As the plants grow, they will get tied to or weaved into the mesh. 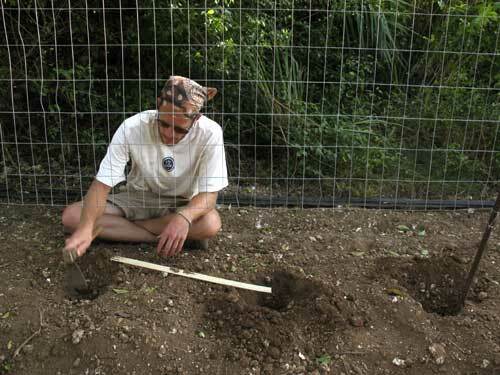 When I arrived, Mike and Cassidy were digging holes spaced two feet apart for the tomato transplants. Muriel and her crew Jade and Devin planned which varieties would get planted where. At least 30 varieties of heirloom tomatoes are grown on the farm. Chalk’s, Red Fig, Aunt Ruby’s, and Cherokee varieties are from Slow Food’s Ark of Taste list. Muriel explained that first she groups by types — cherry with cherry, or roma with roma. Then the colors are alternated — yellow, orange, green, red, pink, brown and black (actually very dark red) — instead of grouped together. This tomato rainbow, as Jade described, is carefully mapped out. When it’s time to pick, you know what you’re picking. Last season, several varieties of same-colored tomatoes had been planted next to each other, and it was difficult to tell them apart, especially when the fruit wasn’t completely ripe. Margie watered the starts (seedlings or baby plants) while they were still in their little plastic pots. Once it was decided which varieties went where, Mike brought over flats of starts, and Cassidy set each plant into its hole and tamped the soil down. Jade followed with watering cans and gave each transplant a good drink. When transplanting tomatoes, remove the bottom leaf or two, and set the plant deeply into the ground, up to the cluster of of leaves. The stem will produce more roots, which results in a stronger plant. Over in another bed, shunjiku radishes had put up their first leaves, and pole beans were sprouting. Drip irrigation lines bring measured amounts of water directly to the plants. Otherwise, not much is growing yet. Margie explained that she started planting late because rain delayed the bedding process. The CSA season is starting in a couple of weeks and I’m wondering what I’ll find in my box. Rumor has it the first share might have green beans from Homestead Organics and lemongrass from Bee Heaven, among other things. Maybe. Whatever is available, Margie said. When you get local food from a farmer’s CSA, you get what’s growing at that time, during that part of the season. Each fruit, vegetable and herb takes a certain amount of time to grow and mature. Greens and radishes take a few weeks to grow, so you’ll see a lot of those at the beginning. Carrots, potatoes, beets and onions take longer, so you’ll see those toward the end of the season. The heirloom tomatoes will start appearing in December and January. That’s the experience of eating in season.